You know the story. Its common Irish-music-lore: The Stars were cheated; they should have been massive; they should have wiped U2 off the map. But no, the Stars of heaven were condemned to stay "the lights of Dublin"; their country and western songs ignored, even in an Ireland run by Cowboys. This collection is a great opportunity for those of us too young to have been there to test those claims and rumours, and acquaint ourselves with a piece of musical heritage. 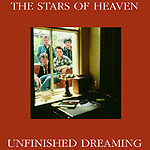 "Unfinished Dreaming" contains 26 songs culled from Peel, Fanning, and miscellaneous, Sessions, as well as unreleased songs from Mother Records and early releases. Considering this, its pretty impressive how uncontrived and organic it sounds. Pristinely clean guitars dictate the drive, as the Stars sing convincingly of love and loss; factories and capitalism; ecological and emotional disasters; pop music and cantankerous roadies. Compared to the ironic and lo-fi alternative-country acts of today, the Stars seem both more fun and more sincere. There are some great covers of classic country tunes by Neil Young, Gram Parsons, and Merle Haggard, but they really shine with their own classics, evocative and emotional songs like 'City on the Hill', 'Ammonia Train' and '2 O'Clock Waltz.' The package also includes a bulging inlay card with commentary from all four Stars on each song and circumstances surrounding the recording. So ultimately, this collection not only ensures that we won't forget about the Stars, but also that we'll know enough to pester whole new generations into recognising their worth. One of the positive things about Ireland's new-found self-confidence/hubris is that we don't feel so obliged to praise anybody who can string a sentence together and has an Irish birth-cert. As such there's revisionism afoot and its finally recognised that most Irish bands in the eighties shouldn't have been permitted to string shoelaces, never mind sentences or guitars. Except that is, for the Stars of Heaven.